BATH & BODY. 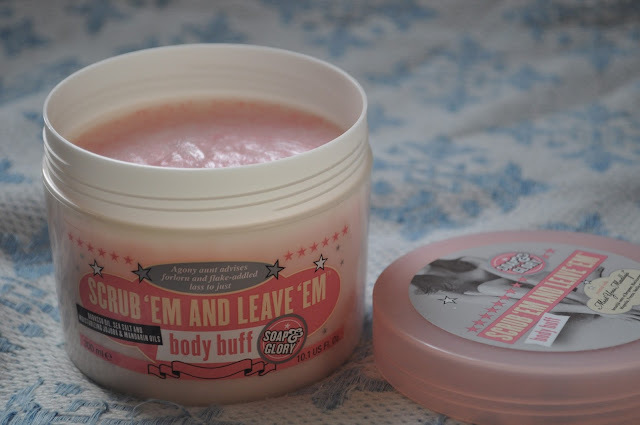 SOAP & GLORY SCRUB 'EM AND LEAVE 'EM BODY BUFF. | Life Looks Perfect. BATH & BODY. 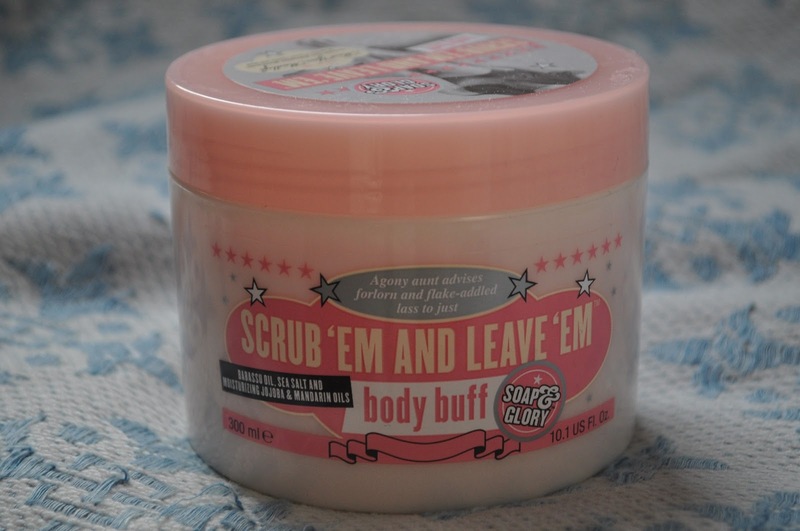 SOAP & GLORY SCRUB 'EM AND LEAVE 'EM BODY BUFF. I do love a bit of Soap & Glory! They are a brand that I trust and every product I have ever used, I have enjoyed using. Their products have been on my beauty shelf since they first launched and I go through pots and pots of their products from skincare to body and even makeup. I like the brand as they are affordable, they are a bit of fun and their products always smell and look great! This is my second body scrub/ exfoliator that I have used from Soap & Glory, with my first being the ultimate scented product Sugar Crush Body Scrub and it went straight into my last months favourites post (Read HERE). As it was my birthday last month, a lovely lady treated me to a whole set of Soap & Glory products to try, this one caught my eye straight away. This is Scrub 'Em and Leave 'Em body exfoliator, which despite the name, I find it to be very similar texture to the Sugar Crush body scrub. Scrub 'Em and Leave 'Em has a slight coarser texture as it includes Sodium Chloride aka your good old table salt, which helps exfoliate the skin. I have always liked a salt scrub, usually it being my favourite treatment if I ever go to a spa (this does not happen often :( huff huff) but this scrub is softer in comparison to others I have tried. I do like quite a harsh scrub, so I am sure this would be coarse enough texture for most people. In comparison to the incredible Sugar Crush Body Scrub, there are tiny little pink beads in Scrub 'Em and Leave 'Em that for me, don't really do much, apart from create another texture. I enjoy using Soap & Glory's body range and for the price and quality of the product they are great value for money. Scrub 'Em and Leave 'Em is part of the 'Mist You Madly' collection from Soap & Glory, which is a very feminine and highly scented product range. The scent of Scrub 'Em and Leave 'Em includes notes of Black current, Magnolia, Freesia and Vanilla, which is great in moderation, but even as I am writing this review, it is a little over powering. For me the fragrance is extremely floral and quite soapy. The fragrance doesn't actually stay on the skin for too long after application of the scrub in the shower but you can follow with the Soap & Glory The Daily Smooth body butter in the same fragrance family to heighten the scent. However be warned that this scrub in particular does contain a lot of synthetic fragrance oils which can be extremely irritable for sensitive skin. With just a little browse through the ingredients, synthetic fragrances such as 'Linalool' can cause skin irritation so be warned sensitive skinned guys and gals. As I luckily don't suffer from sensitive skin, I like the way that the scrub feels and even though it may not fully exfoliate or polish my skin in comparison to a few high end products I have tried, it leaves you feeling moisturised and soft. I think I still have a soft spot for Sugar Crush Body Scrub, so every scrub I use now I can't help but compare them too it!